Betron KBS08 Wireless Portable Travel Bluetooth Speaker Black - £10 (Prime) / £13.99 (non Prime) Sold by Betron Limited ( VAT Registered) and Fulfilled by Amazon. Silver, Blue, Red , are all £8.98 now. Unique Alloy housing KBS Wireless Speakers are compatible with all Bluetooth enabled devices as well as NonBluetooth devices with 3.5mm jack. 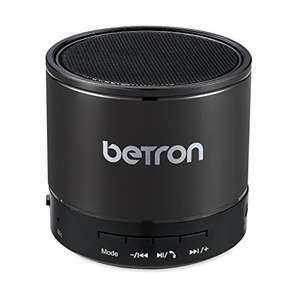 Betron Bluetooth speakers are equipped with built in microphone for Handsfree calling, Builtin TF slot support MP3 Music Play and Built in FM Radio. With most popular KBS08 Travel Speakers enjoy your music anytime and anywhere .Betron Wireless speakers Bluetooth connection can be easily paired with devices within 10 meters range. Betron speakers Bluetooth connection can be easily paired with devices within 10 meters range. Rechargeable speaker streams your favorite music. Crank up the volume and fill your room with music. Place the portable speaker on wood table or desk to get best Bass effect. Got the blue for £8.95 . Signed up for amazon prime free trial for free delivery.